CASE V-42: One does not get to own too many of these knives since they are at least as expensive as First Pattern knives and sometimes cost as much as three to four times a standard P-1. This one is not in quite as good condition as my first one, the one shown further down the page, but the price was affordable, sort of. 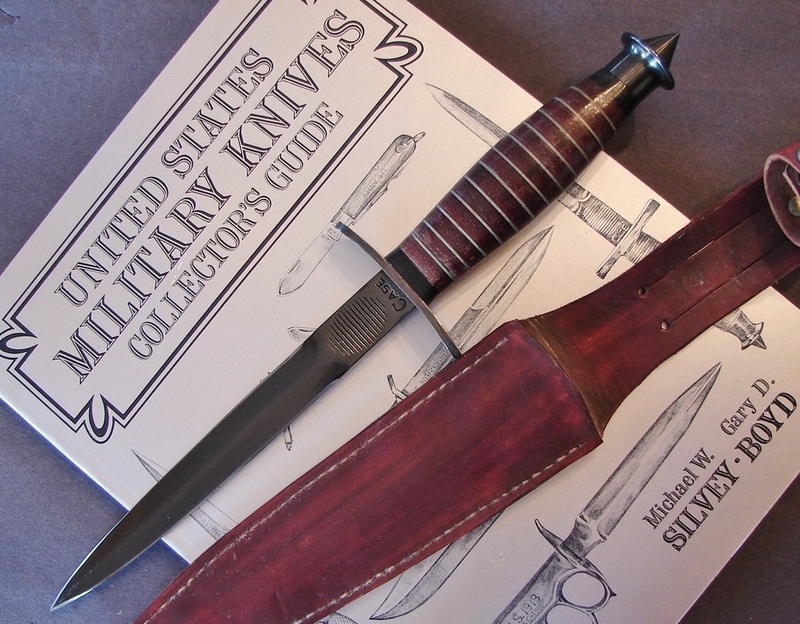 The V-42 is the original "Bad Boy" of the fighting knife world. I cannot think of any other knife as recognizable as the V-42. There are a lot of replicas out there, some good, some terrible, but none of them compare to the pulse racing, heart pounding emotions brought on by holding a real one. The following photos were provided by a good friend. 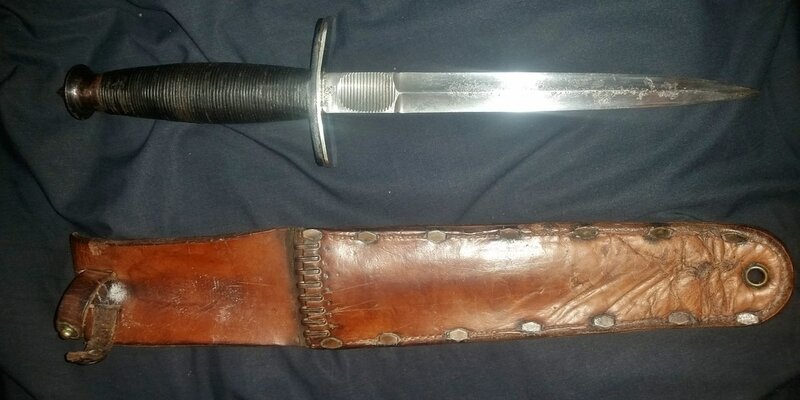 This is an original Case V-42 issued to the FSSF First Special Service Force, known as the Devil's Brigade. 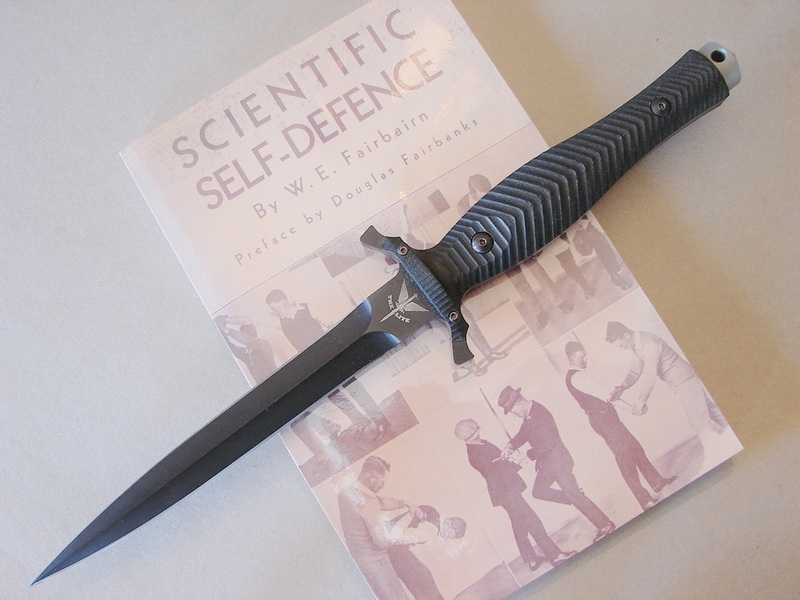 There is no comparable fighting knife in my opinion, but unfortunately it is beyond my financial means to own one. Note the nice old Colt 1911. Update: OK so remember what I said on page one/day one about having an exceptionally understanding wife? This is now my knife, and it is as nice in person as it is in the photos. Owning an original V-42 is now a fulfilled dream of a lifetime of collecting fighting knives. This knife is stamped with "U.S." and the serial number 138. Only the first 500 were serialized. 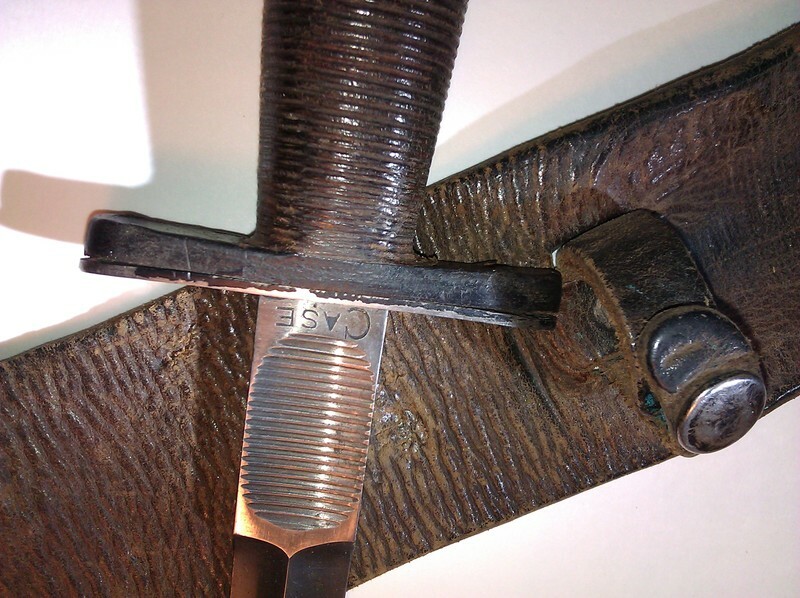 The heavy sheath remains flexible after all of these years and is in excellent condition. It has the typical metal staples at the throat and diamond shaped rivets. For those of you not old enough to remember, the metal staples at the throat were 1/2 of a means of stitching together the heavy canvas and leather belts that drove machinery. Each end had a set of staples affixed by hammering them into the belt material and then a wire slid through the mating openings. These staples prevented the knife from cutting the sheath opening but destroyed the finish of more than one blade. One of the signature design points is the "thumb print" ground into the ricasso. This was done using the same tool that grooved the leather washer handle. The pommel is also unique to the V-42 with its very nasty skull crusher. These were often said to do more damage to the wearer than the enemy, and many of them were dulled to soften the point. A piece of leather cushioned the back side of the hand guard. Four deep hollow grinds give the blade its distinctive shape and also create the high median ridge which gives it strength. The end result is a cruciform blade like many Renaissance daggers. 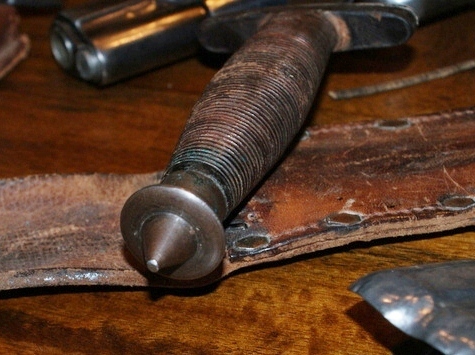 Another unusual and unique part of the V-42 package is the sheath. It was envisioned that the members of the FSSF would be inserted into some northern theaters which required heavy clothing and long winter parkas. To make the knife more accessible to the user they made the sheath with an exceptionally long belt loop. This dropped the knife below the hem of their cold weather gear. 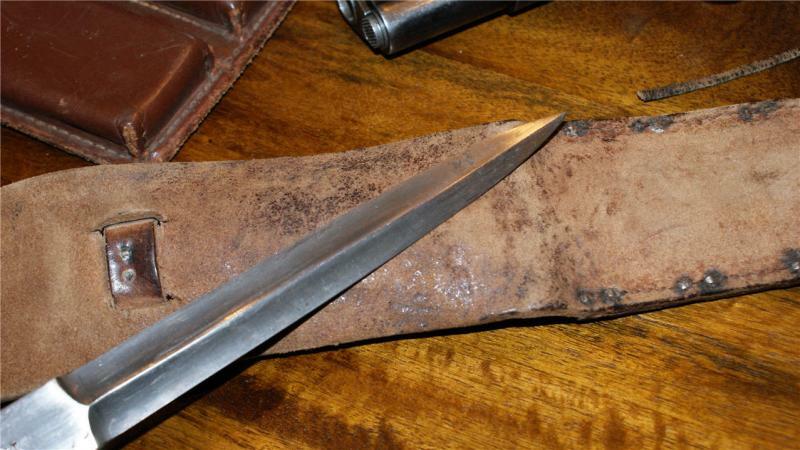 Quite often the sheaths were either shortened by cutting off the extra length or folded over double for daily use. 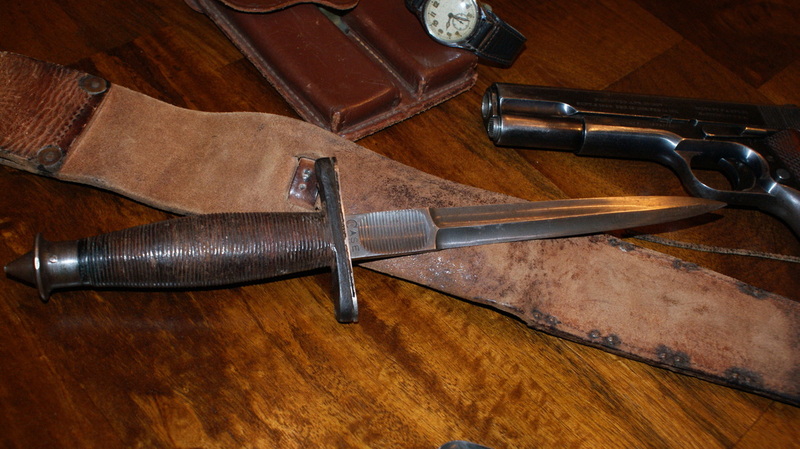 Some of the later ones came in a more standard M-6 sheath. Below: The thickness of the blade can be judged by the depth of the grinds at the ricasso. These four deep hollow grinds also contribute to the blades sharpness. Below: Here is a very nice copy of a V-42 which I believe is from Hanwei, Dalian Forge in China. It was kindly donated to our collection by Teresa from the USN Forums. Thank you for your thoughtfulness. 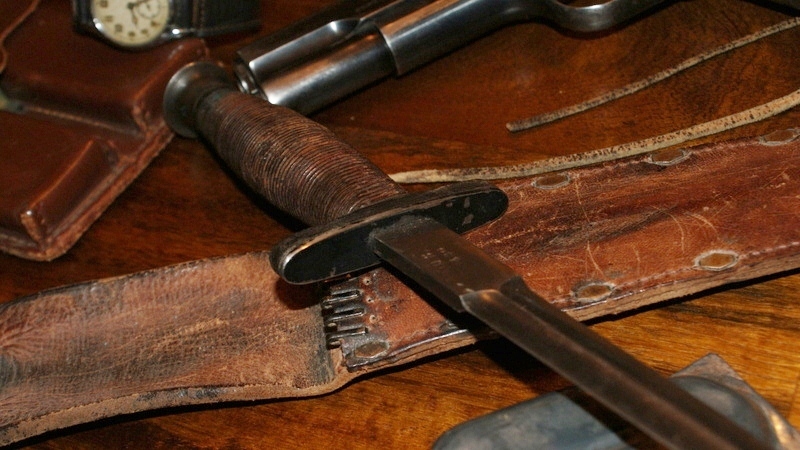 The V-42 has been called a "Force Dagger" or a "Cross dagger" but by whatever name you refer to it, it is one of the most recognizable fighting knives of all time. Unfortunately none of the replicas do it justice, even those by HG Long or Case Knives. Here is one knife that has an aura all of its own. Below: Here is the fabled "Skull Crusher" pommel designed to off your enemy by a strike to the temple. This one has been rounded over slightly since they more often injured the person carrying the knife than the enemy. Below: Case created two commemorative copies of the the V-42 as well as a more mundane version. Shown here is the copy for the American service men. The blade is etched and gold filled: "In Honor of the Americans of the "First Special Service Force." The Canadian version, I believe, had a blued blade. These high quality knives were issued by the American Historical Foundation, Richmond, VA.
Below: Another fine reproduction V-42 by Case Knives of Bradford PA. It has a handle comprised of brass and leather washers. The blade is thinner than the originals and does not have the hollow grinds. It is ground more like an F~S blade. The downward curving guard does not have the leather backer either. Still, it is a high quality copy of the V42 and a suitable combat knife. I made the sheath for it. Below: Case and other cutlery firms (including some in England) have tried to recreate the V-42 over the years but none of the reproductions have come close to capturing the mystique and quality of the originals. The one exception is the new dagger I bought from Mil-Tac which utilizes the best of modern materials to nearly duplicate the simply incredible Case V-42. This is such a fine knife I decided to give you a bigger image of it. It is made by Fox Knives of Italy. This knife is impressive.